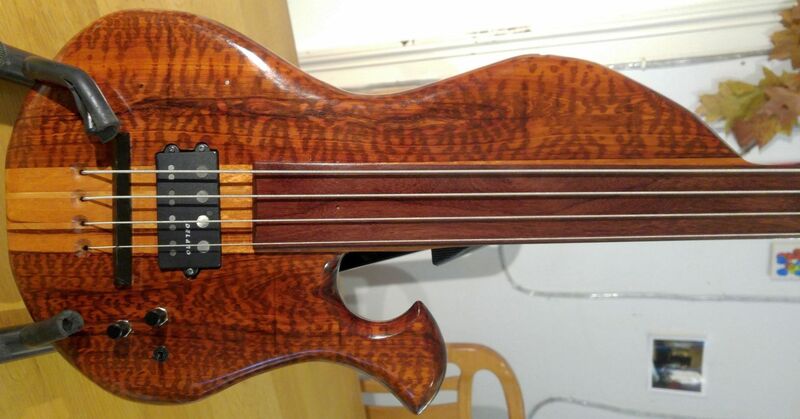 A Wishbass is designed as a low-budget super-fretless bass and is sold as such in the US directly from the luthier. On his homepage (http://wishbass.com/) Steve Wishnevsky explains his concept. The state of delivery of the Wishbasses entices me to various melioration activities on haptics and optics as well as exchange of the entire hardware and electronics. The woods are not varnished but just oiled (true-oil coats) and thus remains breathable and attractive. The fingerboards are given a 16-inch radius and a fine finish (between 1200 and 2000) and (optionally) fret markings on the fingerboard side edge. „If you don’t want to tinker with it, do what I did and buy a „refinished“ one.